MOSCOW, Russia -- A top aide to Vladimir Putin decides how the pro-Moscow administration of eastern Ukraine is run and who gets what jobs there, three former rebel leaders said, challenging Kremlin denials that it calls the shots in the region. 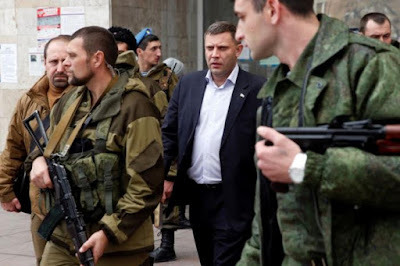 FILE PHOTO: Head of the self-proclaimed Donetsk People's Republic Alexander Zakharchenko (C) leaves after the first session of the new local parliament in Donetsk, Ukraine, November 14, 2014. Their comments shed light on the role played by the secretive Vladislav Surkov, who has long been at the Russian president's side. The Kremlin says his official role is to advise Putin on Ukraine, where the rebels are fighting government forces. The extent of his influence and powers has not been spelled out or acknowledged by the Kremlin which casts its role in the conflict as one where it has influence but is not a protagonist. The three men who have held senior roles in the separatist movement in eastern Ukraine have explained in detail how Surkov controls the situation on the ground via handpicked proxies who give him regular situation reports, used aides to arrange elections there, and has worked to build power structures that are responsive to Moscow's wishes. "Any call from Moscow was viewed as a call from the office of Lord God himself and... was implemented immediately," recalled Alexei Alexandrov, one of the leaders of the separatist rebellion in Donetsk who has since left the area in eastern Ukraine. Two other separatists corroborated his account, but declined to be identified. Surkov and Kremlin spokesman Dmitry Peskov did not respond to questions about the extent of Surkov's role in Ukraine. Ukrainian President Petro Poroshenko's office also declined to comment. Correspondents have previously gathered evidence that Moscow sent Russian troops and irregular fighters, and weapons, to help the separatists, who tried to break away from Ukraine in 2014. A senior former separatist described last year how Russian financial support propped up the breakaway area. The Kremlin has always rejected those accusations as part of its effort to get Western sanctions imposed on it over Ukraine eased. Correspondents were unable to independently verify the separatists' descriptions of Surkov's role, but their individual versions of events tallied with one another, with key details and dates consistent with existing open source information about Surkov. Alexandrov and the two other officials said their willingness to speak out underscores a sense that their uprising has been hijacked by the Kremlin, which has put in place loyalists who they say do not have the region's best interests at heart. All three said Moscow had gradually forced out most of the separatists behind the original uprising by using threats of death and detention. "At first we were a bit naive and thought that maybe our Moscow uncles simply didn't understand what was happening here, when our Moscow comrades treated us like dirt," said one of the three former separatist leaders who said he last spoke to Surkov in November. "But then I understood that they understood everything, and simply wanted us to keep our mouths shut." Surkov helped Putin engineer Russia's tightly controlled political system and coined the term "sovereign democracy" which the Kremlin uses to describe that system. Viewed in the West as one of the architects of Russia's annexation of the Crimea peninsula from Ukraine in 2014, Surkov was blacklisted from entering the United States and the European Union in March of that year. He told a Russian newspaper that being on Washington's blacklist was a "big honor" for him. The separatists who came forward to describe Surkov's role say he also played a key role in the appointment of Alexander Zakharchenko as leader of the self-proclaimed Donetsk People's Republic (DNR) in eastern Ukraine, the rebels' biggest breakaway entity by population. Zakharchenko, a former coal mine electrician from eastern Ukraine, was the leader of an anti-Kiev militia when he was summoned to Moscow in 2014. Separatist leaders were grooming him to be defense minister in the DNR. But after he met Surkov in the Kremlin, word came back from Surkov's office that Zakharchenko was to be given the top job. A spokeswoman for Zakharchenko did not respond to written questions. At the time, the Donetsk rebels had been led by two men who described themselves as volunteers from Russia. Far-right former journalist Alexander Borodai was the political chief, and Igor Strelkov, who said he was a former agent in Russia's federal security service (FSB), was the military commander. Moscow wanted them replaced by a local to try to show the West that the uprising was a grassroots phenomenon, Borodai said. It picked Zakharchenko, whom it viewed as easy to control, said one of the three ex-separatist sources. After what Alexandrov described as a verbal order from Surkov's office, Borodai and Strelkov quietly stepped down so that Zakharchenko could take over. Borodai said he had been the first to suggest that Zakharchenko take over, but declined to answer detailed questions on the subject. Strelkov did not respond to a request for comment, but has previously said he left the region after coming under pressure from people he declined to name. After Zakharchenko was made leader of the Donetsk separatists, the region held an election which confirmed him in office. A team of Russians who worked for Surkov arrived in Donetsk to help run Zakharchenko's campaign, said Alexandrov. That assertion could not independently confirm. Ukraine and its Western allies then rejected the vote. Separatists shrugged that rejection off, however, and Moscow suggested the Ukrainian government could now negotiate directly with the separatists, an offer Kiev spurned. The contested election helped entrench Zakharchenko, all three former rebel leaders said. Surkov's election team did not tell anyone in Donetsk their real names, and used military-style radio call signs instead. Asked how he knew they worked for Surkov, Alexandrov said: "They didn't hide it. They announced it loudly at the first opportunity." Five sources, including one close to the presidential administration and another who worked with Surkov in the Kremlin, said Surkov has regular meetings with separatist leaders, both in the breakaway territory and in Russia. They say his involvement continues now, three years on from the start of the rebellion in eastern Ukraine. Alexandrov said he met Surkov in Moscow in August 2014. Another of the former separatist leaders said his most recent meeting with Surkov in Moscow was in November last year. Surkov had at least three meetings last year with Victoria Nuland when she was U.S. Under-Secretary of State for European Affairs -- in January, May and June -- according to the U.S. embassy in Moscow. Nuland told reporters at the time that the meetings had been part of a U.S. attempt to get all sides to implement the Minsk accord, which introduced a shaky ceasefire in eastern Ukraine and laid out steps for a political solution to the conflict. Her meeting with Surkov in June in Moscow was "thorough and constructive," the U.S. embassy said. But the sources said Surkov's true role went far beyond acting as a peace broker. Surkov's activities, which began at least six months before the internationally-brokered Minsk peace deal, focused on choosing personnel to take senior posts, on creating a structure for the separatist administration, on formulating a media strategy for the separatists and planning local elections. After meeting Surkov in May, Nuland had warned that such elections, organized by the separatists without Ukrainian government involvement, would be ignored by Washington. Poroshenko's office declined to comment on these accounts.